It’s difficult to explain it but last nights head shaving experience was possibly one of the loveliest nights in my life. I will always remember it. I was dreading it very much and yet I have never felt closer to my family or appreciated their kind and loving natures more than now. 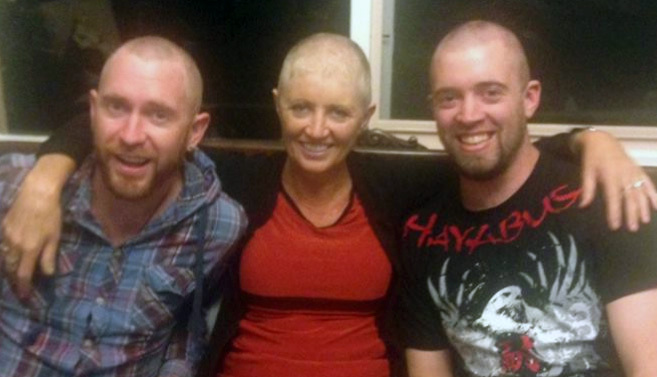 The boys, because they were so strong and joined me in my head shaving. They are quietly dealing with stuff and yet showing they care by their actions. Sophie because she did all of the shaving of the heads and fought her own emotions to make it all feel ‘ok’. That was a tough gig for her and I love her so much for being so caring and sensitive. Colin for telling me I looked beautiful and that he loved me. Ashlee (Blake’s girlfriend) because she is a gifted talker. I asked her to tell me a story to distract me during the process. She talked non stop, was totally upbeat and positive and I was so grateful to her for being who she is. She is a doll! So after the deed was done, we had photo shoots, including this one with my hat collection on. Don’t the boys look adorable? This morning I went to gym with Sophie with just a cap on. How brave was that? I looked like some weird bogan. I swear I could go and rob a bank and then wear my wig and nobody would recognise me. Aha. Evil plans hatching. I have 2 wigs but they need to be ‘adjusted’. The short one doesn’t look too bad but it still needs work. I’m going tomorrow to get them cut to my face shape better. So here is my short wig. It’s a weird feeling being bald but quite liberating as well. The wind doesn’t blow my hair into my eyes, it doesn’t tug at my head, I don’t have to wash or style it. I’m saving on shampoo, hair cuts, hair dye and ‘bad hair days’. OK… so here’s a blonde story for you. I woke up last night and it was pitch black dark. I could hear Colin getting ready to go play golf. WHY, I was thinking, is he getting ready to play golf at 2am? It’s the middle of the night. I drifted back to sleep. Then I woke to hear Sophie crashing around the house, as she does. WHY, is she up in the middle of the night? It’s pitch black dark. Then about 10 minutes later, I realised that the beanie I put on before I went to bed to keep my head warm, had drifted down over my eyes. It was 8.30am and broad daylight. So glad I can blame ‘chemo brain’ instead of my dumbness. ← I’m moulting! moulting! Oh, what a world! What a world! What a beautiful family you have Jenny and we all know where that beauty comes from.